A swarm of students converged at the University of Delaware's Harker Interdisciplinary Science and Engineering (ISE) Lab Thursday to participate in the Undergraduate Research and Service Celebratory Symposium, the culmination of 10 weeks of study and service. With more than 400 students presenting details of their work, it was the largest gathering in the event's seven-year history. Students from more than 40 institutions participated. Their work spans the diverse intellectual domain at UD – from the arts to the social sciences, natural sciences, engineering, environment, health sciences, agriculture and natural resources, marine studies, education – and taps into the extensive expertise of many faculty mentors and external partners as well. “We see just how deeply undergraduate research is woven into the fabric of UD’s culture," said Iain Crawford, UD's faculty director of Undergraduate Research and Experiential Learning. "That those presenters represent more than 40 institutions beyond UD is a testimony both to the research funding our faculty have been able to attract and to the ties that many of our programs have built with colleagues at other colleges and universities who are delighted to send students to work here over the summer. Joseph Gardner, a junior fine arts major from Newark, Delaware, worked on a sculpture project – with ceramics and metalwork – that explored the desolation of post-nuclear Earth. As part of his study, he read much of physicist Herman Kahn's government report upon which Dr. Strangelove was based. His faculty mentor is Abigail Donovan, associate professor of art and design. 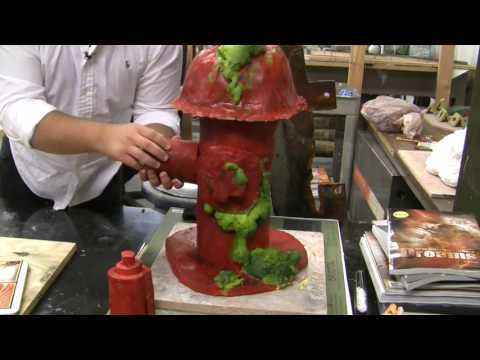 One of his pieces is a red, post-nuclear fire hydrant, with green slime oozing from it. "You think about what a fire hydrant is – at its root it's a water supply," he said. "In a world that has seen devastation from nuclear explosions, there would be radiation-infected ponds, rivers. But with a tank underground, a fire hydrant could be your only chance of clean water – a necessity for human life." 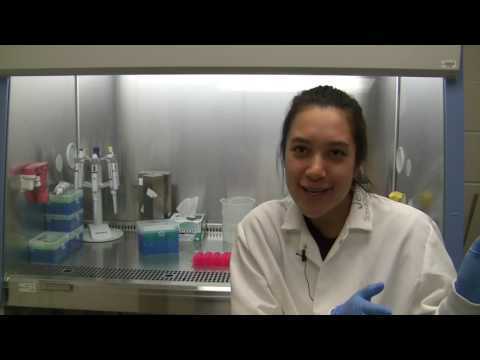 Jennifer Lawrence, a junior double major in biological sciences and neuroscience from Seaford, Virginia, has been working in the lab of Jaclyn Schwartz, assistant professor of psychological and brain sciences, to understand differences in female and male brain cells and the root causes of why they are more or less prone to such neuropsychiatric disorders such as schizophrenia or multiple sclerosis. She hopes to pursue a doctorate and study other diseases. She is thrilled, she said, to pursue new discoveries and perhaps contribute to preventing such disorders. But one of the most memorable experiences of this research, she said, was when she and others in the lab thought they had a significant finding after months of study – only to discover something quite different. "We crunched all the data and we were really excited," she said. "It was late at night and we were staying over hours, typing in the data to see what it was, and then it was not what we thought it would be. At first I was crushed. We spent all this time and the data means nothing. "We went in so defeated and our professor just lifted us up. 'No, this is exciting.' And I learned that we can't get so upset about something when we don't know what it is yet. That made me even more excited about the research, when I initially thought this is the end." 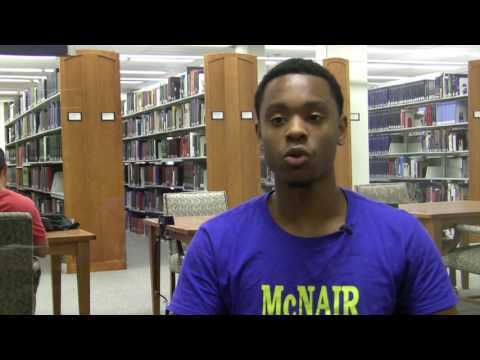 Julian Jackson, a senior communication major from Philadelphia and a McNair Scholar, has been studying the tension between free speech and hate speech with his faculty mentor, Jennifer Lambe, associate professor of communication. He is looking specifically at how the legal system treats such speech, reading case briefs and opinions from the Supreme Court's files and peer-reviewed articles as he works to understand the nuances of legal protections in the United States. "The United States uses a model of communication that is like cause and effect to condemn hate speech," he said. "The other side of it is, the United States looks at a model where in order to protect the free-speech culture, they look into the future to restrict blocking speech.... It's the difference between how they punish hate speech and how they protect hate speech." He sees education and the willingness to speak up when you hear something wrong as essential to promoting free speech and defeating hate speech. Working with Lambe has been extremely helpful, Jackson said. "Before this summer, I've never experienced research at all," he said. "It has taught me how to think in a research mindset. And she mentored me step by step, suggested what I should do next and gave me a lot of advice about the future. I have her to thank, a lot." A sampling of other student research this summer may be found on the University's Tumblr page. In a note in the symposium program, Provost Domenico Grasso said participating students will reap the benefits of their focused efforts for years to come. "Studies have shown that these types of experiences are among the most important forms of learning," he wrote. "We know that engaging in mentored research can be a life-changing experience. Some of the students will build from this program as they go on to graduate school; others will find the experience they have gained invaluable as they move into professional careers. All of them will look back on these summer months as some of the most intensive and successful parts of their education." Among the participating schools were: American, Beloit, Bloomfield, Boston, Brandeis, California-Berkeley, Case Western Reserve, Columbia, Cornell, Dartmouth, Florida, Florida A&M, Howard, James Madison, Jefferson, Johns Hopkins, Marquette, New York, North Carolina State, Oberlin, Penn, Penn State, Rochester, Swarthmore, Southern Nazarene, Temple, Villanova, Washington, Yale, as well as nearby schools such as Cheyney, Delaware State, Lincoln, Wesley, West Chester and Delaware Technical Community College.